In part 1 of this series, I talked about the pains that I and my colleagues have experienced when working in code bases that used N-tier data-centric architectures. In this post, I will detail one approach which has allowed me to escape that madness. I use that statement to remind myself that layers can sometimes do more harm than good. That also reflects my experience. Of course, it's not really the number of layers that's the problem, but rather, how the dependencies between those layers are set up and what abstractions those layers represent. These are okay architectures, with the domain-centric architecture being preferred over the data-centric one. However, when talking about horizontal layers, they both present the same difficulties. 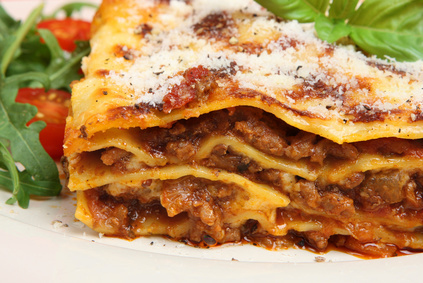 Whenever you want to make a change, you have to cut across all layers (like a lasagna). If the service / repository classes reflect the database structure, the code you have to write to support non-CRUD actions become complex rather quickly. I wrote about the pain points in more detail in the first post, so I won't repeat those here. I just shared those images so we can contrast it with the solution I've been using. You can view the entire talk here. But it can be clearly seen from the diagram that some of prominent horizontal layers, particularly the business logic and data layers, are gone. In this design, every vertical slice encapsulates a user action, a business requirement. Regardless if that requirement is CRUD or non-CRUD in nature, all of the logic is handled in just one isolated part of the code. Also, it's important to note that the persistence layer as depicted on the diagram are generic repositories, such as the one provided by Entity Framework via DbSet<T> out-of-the-box. There are no custom repository classes per entity that are shared. That way, changing a vertical slice does not entail change to the repository layer. 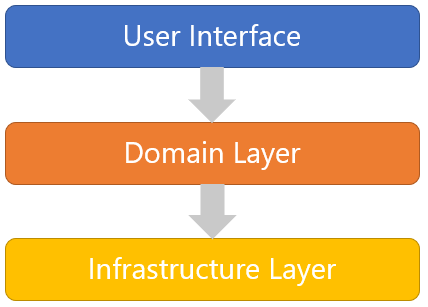 Going one step further, the persistence layer could be replaced by an infrastructure layer. The infrastructure layer would contain the generic repositories, and it would also cross-cutting concerns, like logging and email. All of these pieces can then be injected as seen fit to each individual vertical slice. An important part of this design is that there are no dependencies between the feature slices. One library I found that really helps implement vertical slices is MediatR. With MediatR, a vertical slice is represented by three classes: a class encapsulating input parameters, a class representing the implementation, and a class representing the output. The request class here is Query, the response class is QueryResult, and the class that does all the logic is QueryHandler. Inside the handler, classes from the infrastructure layer (ApplicationDbContext in this case) can be injected. If and when a need for a domain layer arises, usually to encapsulate common business logic, they can be injected in the handler class as well. The dependency injection container could be set up such that MediatR finds the correct handler classes based on the parameter. What ends up happening is that each controller action's implementation essentially just becomes a call to MediatR's Send command. You automatically get adherence to "thin controllers, fat models" for free, and the controller ends up looking much nicer. Each controller action gets a corresponding request-response-handler class trio that represents the vertical slice. Okay, now to note the differences between that approach and the layered approach. The handler class in that example takes the place of what was previously the business logic class and custom repository class. All logic is implemented there. Yes, I know what you're thinking right now: "but what about reuse?" Going back to the pain points about using layers, one of the tradeoffs of reuse is coupling. When you successfully reuse a method, you also successfully couple all the callers of that method. Now, that may or may not be a good thing; it depends on the situation. But the beauty of using vertical slices is this: since reuse is not the "default" position, there's less chance of messing it up by introducing bad coupling. This is a very important point that's worth repeating: reusable code is written as the need for them is discovered, and not sooner. Starting with vertical slices essentially means you get adherence to YAGNI and KISS. Perhaps more importantly, the reusable abstractions that eventually get created tend to be the best abstractions needed in that specific domain. This of course is a natural side effect of creating abstractions based on actual need and not just based on what are essentially predictions, however thought-out those predictions may be. When dealing with non-CRUD operations using entity-centric service / repository classes, you have to spend some amount of brainpower on which class to put the implementation in. This is also something I talked about more fully in part 1 of this series. But when using vertical slices, particularly with the MediatR library, there's really no effort involved: you spin up a request-response-handler trio every single time. Here's an example: Suppose you have a repository class (eg. ProductRepository) that uses an ORM under the covers. Now, you find that you need to use raw SQL for one particular action. You can make the change in the particular method in the repository, but if you do, that method will be the odd one out in terms of implementation. All of a sudden, you find the consistency of the class breaking down. This is a broken window that may consume the entire project if not addressed. This, of course, is another example of coupling: technology decisions that are applied across an entire layer. Technology decisions are difficult things to reverse and require much preparatory thought. But when implementations are encapsulated in vertical slices, with each slice being independent from one another, new technologies can be tried in an isolated context without fear of breaking other existing functionality. This was the second and final part of my series "The Tyranny of Horizontal Architectures (and How You Might Escape)". The design I've been using to solve the layer madness is to ditch the layers entirely. Instead, I focus on creating isolated vertical slices per feature, utilizing the help of infrastructure classes as necessary. Shared layers are only introduced as the need for them arises. If you're interested in trying this out, Jimmy Bogard has provided some example templates on his GitHub site. I'm also working on my own templates that use MediatR. Give it a shot, and let me know what you think in the comments below!